I listened to the song.It is quite melodeous. Thank you for sharing your music. 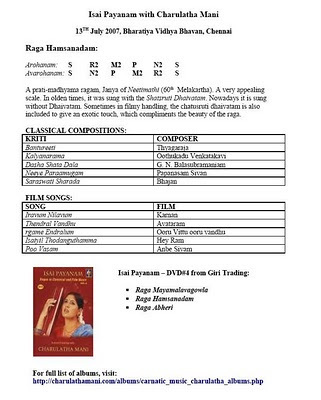 We loved it and are quite amazed of your knowledge about the ragas. We look forward to more music sharing through your website Isaipayanam and updates. You bring me closer to the divine Charulatha. Keep it up. God bless you. "Ehiludai hamsanadham..." is a work of Tanjavore Sankara Iyer is also in Hamsanadham, a wonderful composition.